Mincing is a very fine cut that is suitable for many vegetables and herbs. When mincing herbs, rinse and dry them thoroughly, and strip the leaves from the stems. Gather the leaves in a pile on a cutting board. Use your guiding hand to hold them in place and position the knife so that it can slice through the pile; coarsely chop. 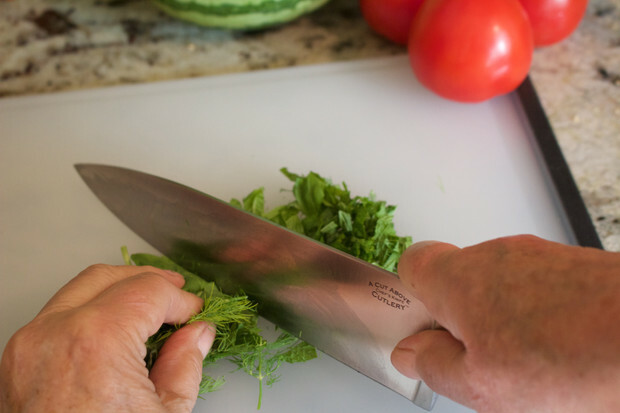 Once the herbs are coarsely chopped, use the fingertips of your guiding hand to hold the tip of the chef’s knife in contact with the cutting board. Keeping the tip of the blade against the cutting board, lower the knife firmly and rapidly, repeatedly cutting through the herbs. Continue cutting until the desired fineness is attained.